I really have fallen behind on blogging for which I am terribly sorry. There is just so much “stuff” requiring Baby Lady’s and my attention. Besides me, Baby Lady’s work schedule has been maddingly busy and blogging is a lot of work besides just cooking. Even if I weren’t busy I simply couldn’t keep up with the pace. You see, Baby Lady is an essential partner not only in my life but on the blog, as well. She really is an integral piece of any puzzle that involves me. Not only does she have her own recipes she likes to share but she is my sounding board on my/our recipes, what we want for dinner, how to tweak this or that and the perpetual “what do you think about this?” In addition, she has the daunting task of being the blog photographer which, as any food blogger knows, is no small task. She works really hard at capturing the pouring shots for Conor‘s pleasure while he is conquering the blogging world one country at a time. 😉 She also is able to provide a different vantage point for the photos which makes them better, more artistic and interesting. More importantly, she actually captures me working to show I really do something. 😀 😀 You can always tell when I am having to take my own photos as they just aren’t the same. 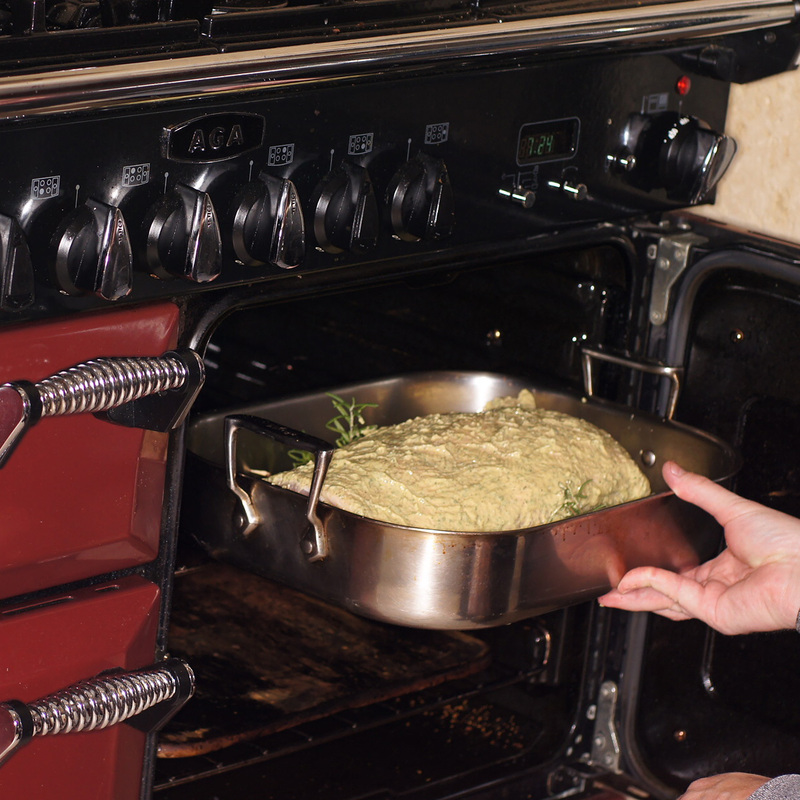 Nevertheless, we are still cooking 5 – 7 nights a week along with breakfast and lunch for Quickstep. Although he complains about his diet, his friends keep reminding him they wish they had their own professionally trained, personal chef. He also has lost 130 lbs eating the food posted on the blog which his friends (and ours) find hard to believe. It just goes to show what a little exercise and low carb diet without processed foods can do for you. Of course, he still eats some highly processed foods, i.e. chips with his lunch sandwiches, but his luncheon meats are roasted here at the house with our own blend of seasonings, and served with homemade sandwich spreads, homegrown greens, etc. One of these days we need to do a post on Quickstep’s lunch. Still, he misses his commercial bologna and Spam. Heaven help me!! Ah, but I digress. Because I have fallen so far behind, I am trying to catch up on some of the prior meals we have made. There are lots of meals for which we have photos but were busy at the time and no posting was made. This is always comical because most of the meals we eat we make up as we go along. So, after a week or so it’s difficult to remember exact quantities. You just hate for the opportunity to slip out of your grasp. That is the case with this meal. We made this meal last November. That’s why you see me wearing a long sleeve sweater. No one in their right mind would do that in August. It was an incredibly delightful meal that we wanted to share. It all started out with Baby Lady seeing a large piece of meat on the counter. The conversation then went something like this. Baby Lady: What are you going to do with that large piece of meat you have out. Me: I don’t really know. I’m going to roast it but I haven’t decided how to season it. Baby Lady: I really liked that bourbon sauce you made last time. Me: No. I’m not interested in doing that. I was thinking about roasting it atop a whole lot of rosemary to see if roasting atop rosemary would give it a deeper rosemary flavor. What do you think about that? Baby Lady: That’s interesting. What else are you going to do. I really liked that mustard sauce you did last. 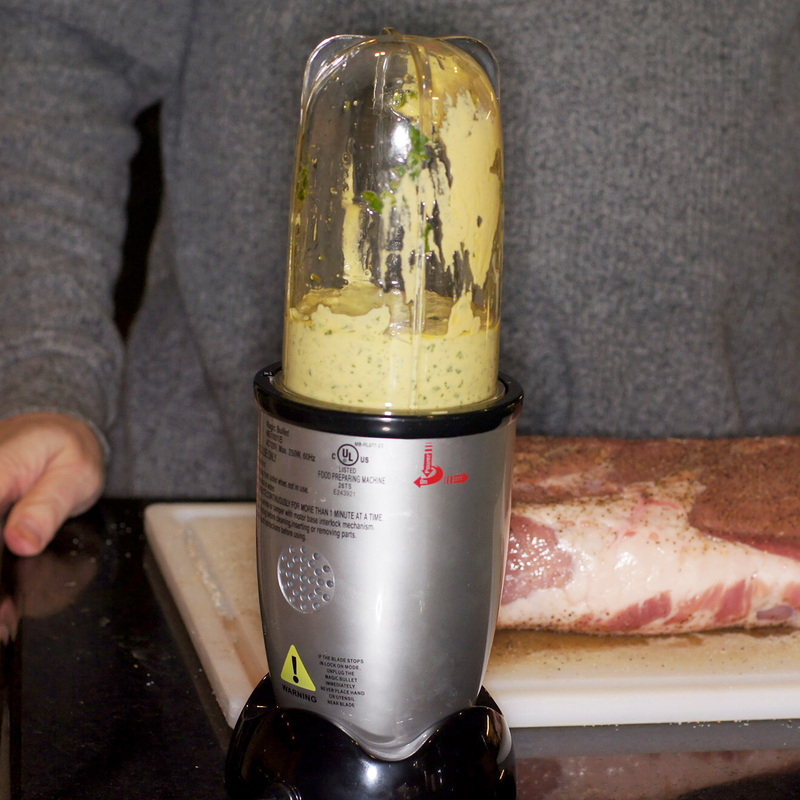 Me: Well, I could do a mustard crust similar to the roasted split chicken with mustard crust you love so much. Baby Lady: That would be nice. Are you going to do the sauce, too. Me: I’m not sure I can but I can make a nice sauce to go with it. 1 pork loin, trimmed but with some fat cap left on, roughly 7 lbs. First things first. Go attack the large rosemary tree in the backyard and harvest enough rosemary to heavily line the bottom of the roasting pan. and pepper to the pork loin. 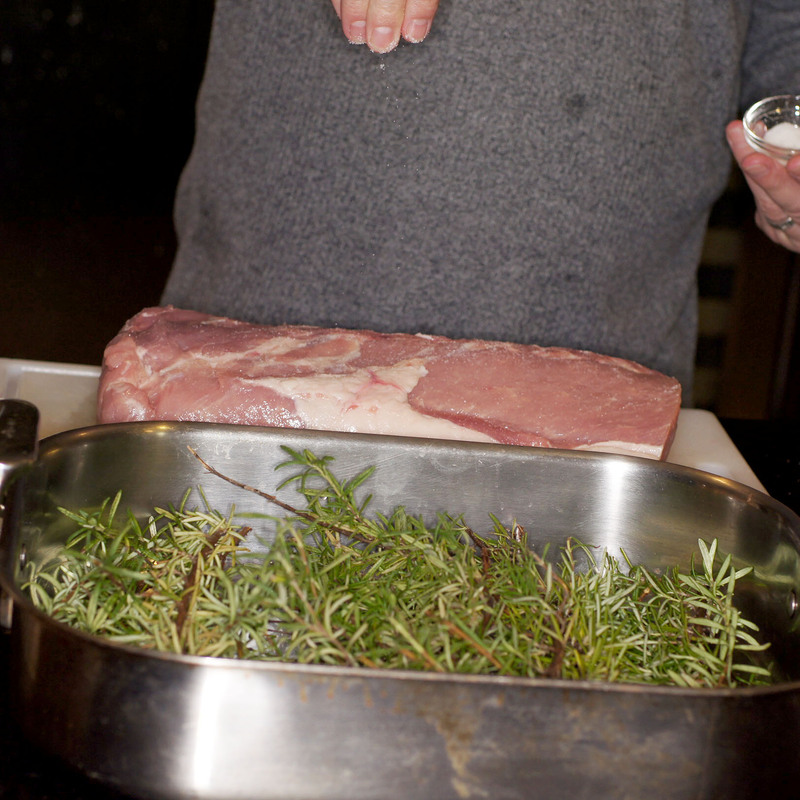 Flip the pork over and place it atop the rosemary branches – these were definitely not sprigs. 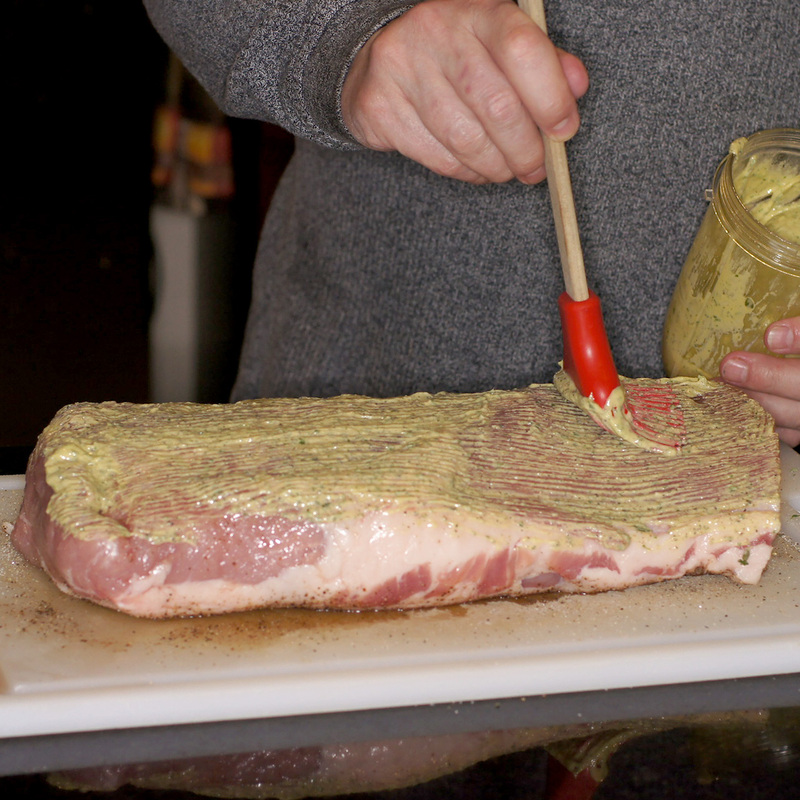 Then brush the remaining mustard crust on top of the trimmed fat cap of the pork. 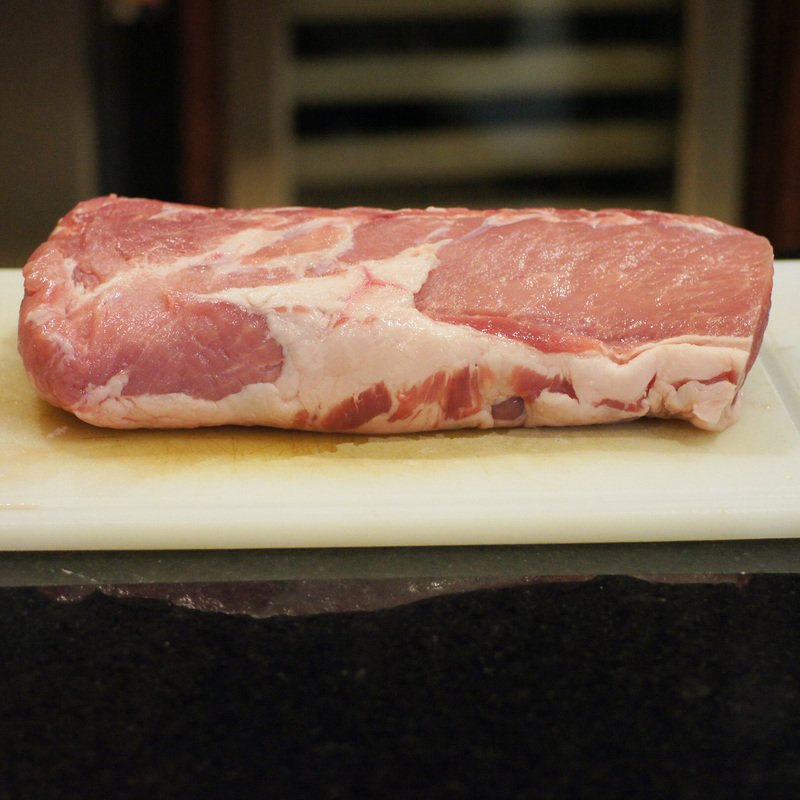 Close the oven and roast the pork for 15 – 18 minutes per pound, depending upon how you like your pork. When the pork reaches 135 – 140 F on a meat thermometer (again depending upon how you like your pork), remove the pork from the oven. Doesn’t this look nice? Now, while the pork was merrily roasting away, add the remaining 2 Tbsp of olive oil to a sauté pan. 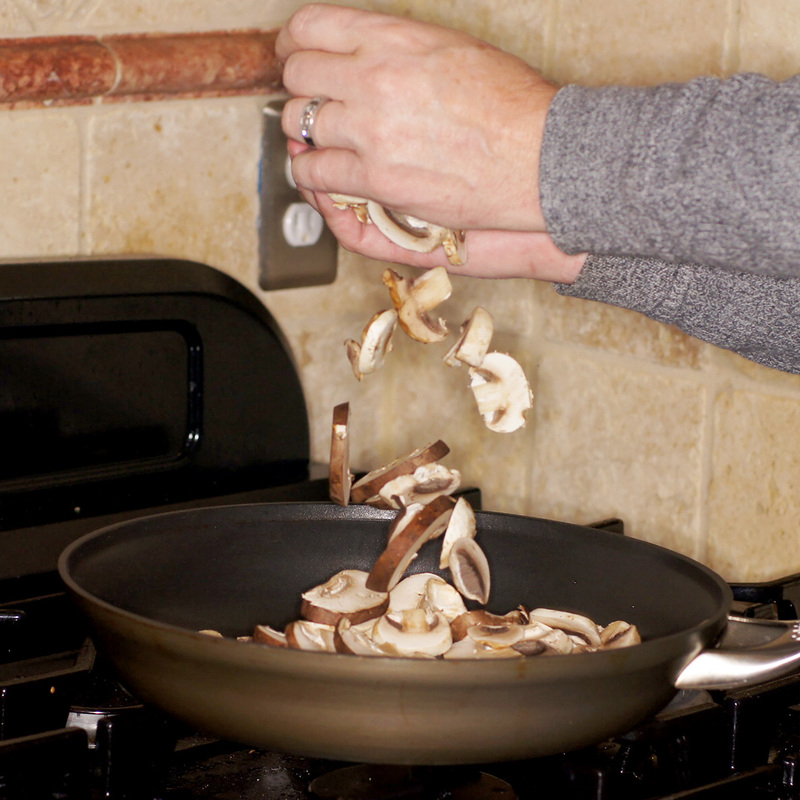 Then add the sliced mushrooms and sauté for 2 – 3 minutes. Add 1 cup of pork stock and continue to cook until stock is reduced by 50%. Set aside until after pork loin is removed from oven. 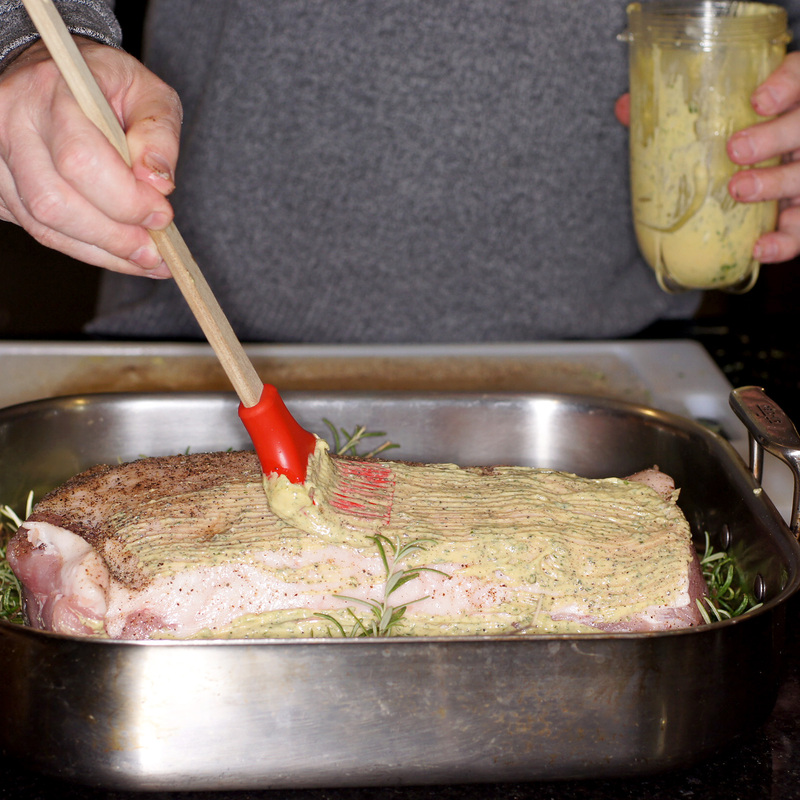 Once the pork loin is done, remove it from the roasting pan and allow to rest tented with foil for 5 – 10 minutes. 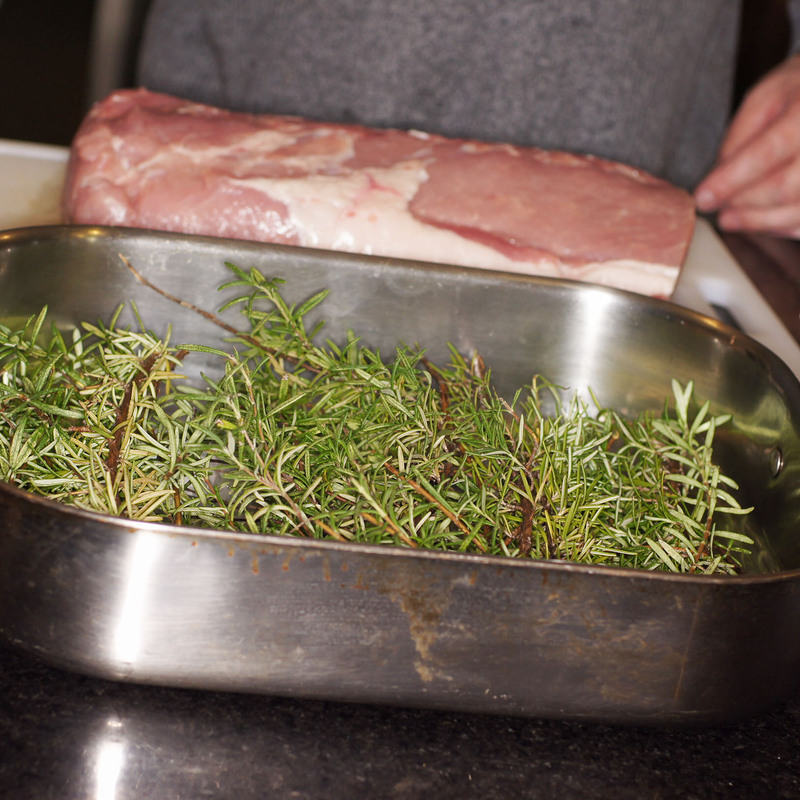 While it is resting, remove the rosemary from the pan and discard. 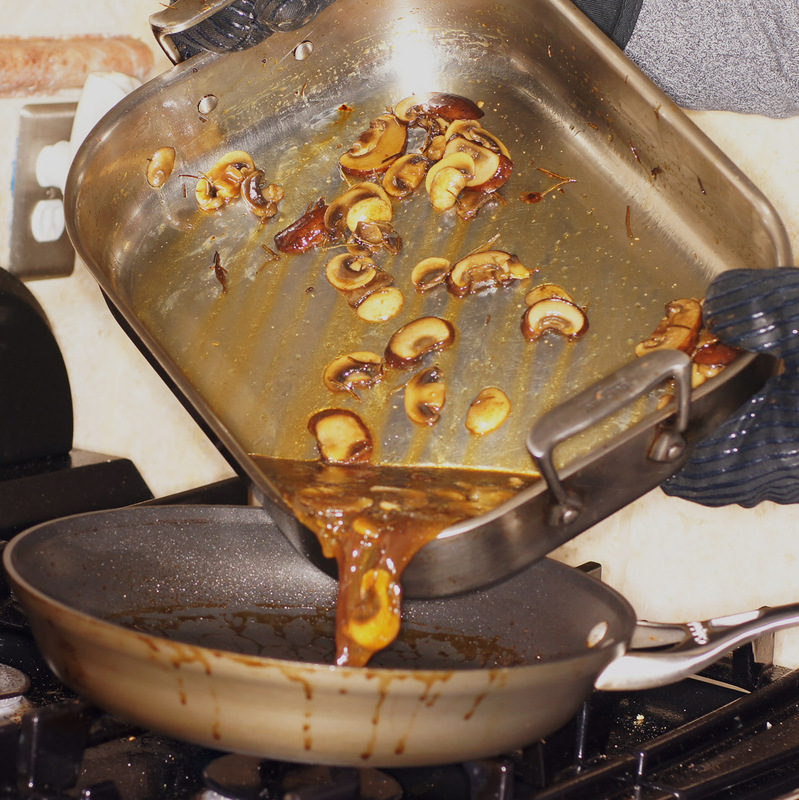 Now, place the roasting pan over direct heat and add the mushrooms and liquid to the pan to deglaze the roasting pan. There are tremendous flavors with great depth of character in the sucs from the roasting pan and we don’t want to lose any of this delicious goodness. Next, add the remaining cup of pork stock and deglaze the pan scraping up the little brown crusty tidbits on the bottom. 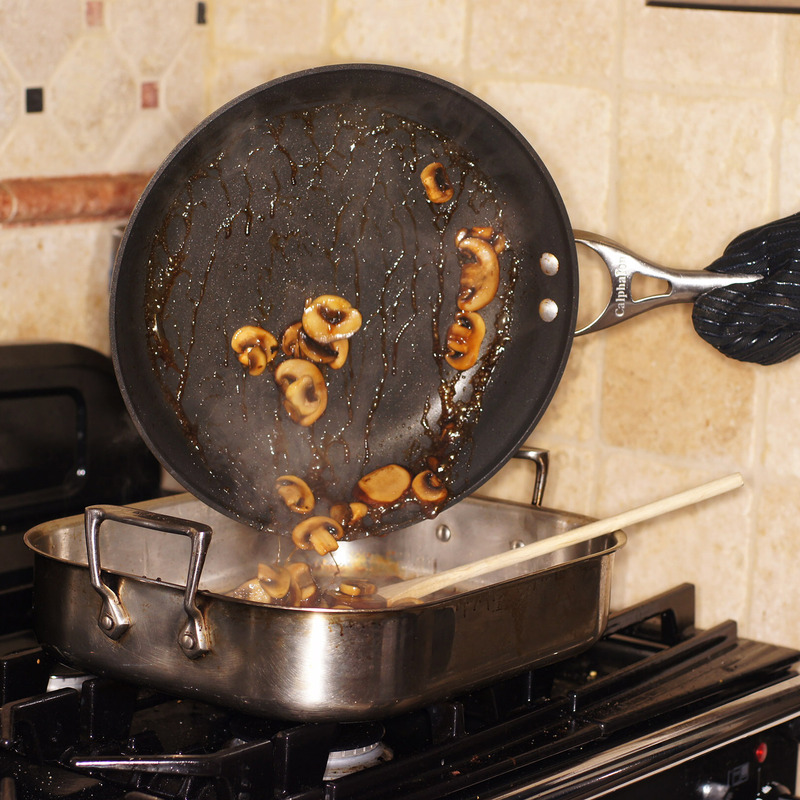 When you have deglazed the pan, return everything to the sauté pan. You don’t have to do so but I find the sauté pan easier to work with and it’s dirty already. 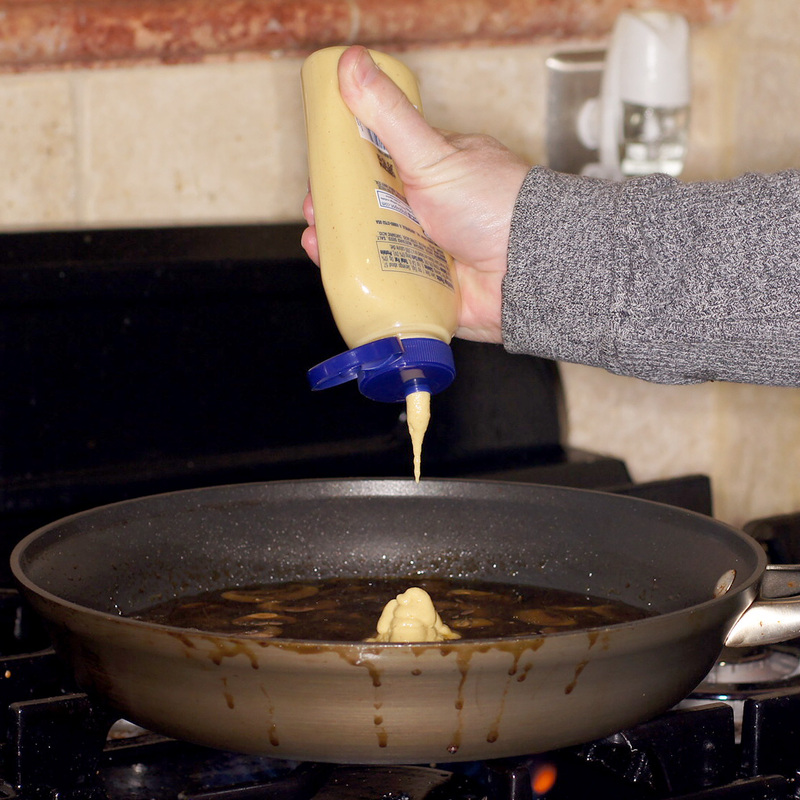 Now, to enhance the mustardy flavor, add the remaining 1/4 cup of mustard to the sauce and whisk together to incorporate. While this was going on I made a white roux with the 2 Tbsp butter and 2 Tbsp four. Add as much of the roux as necessary to tighten your sauce. Remember, 2 Tbsp butter and 2 Tbsp flour will tighten 1 pint of sauce. My recollection is I used about 1/2 of the roux. What you don’t use you can refrigerate for another day. Cooks for several minutes to allow the flour in the roux to cook out into the sauce. 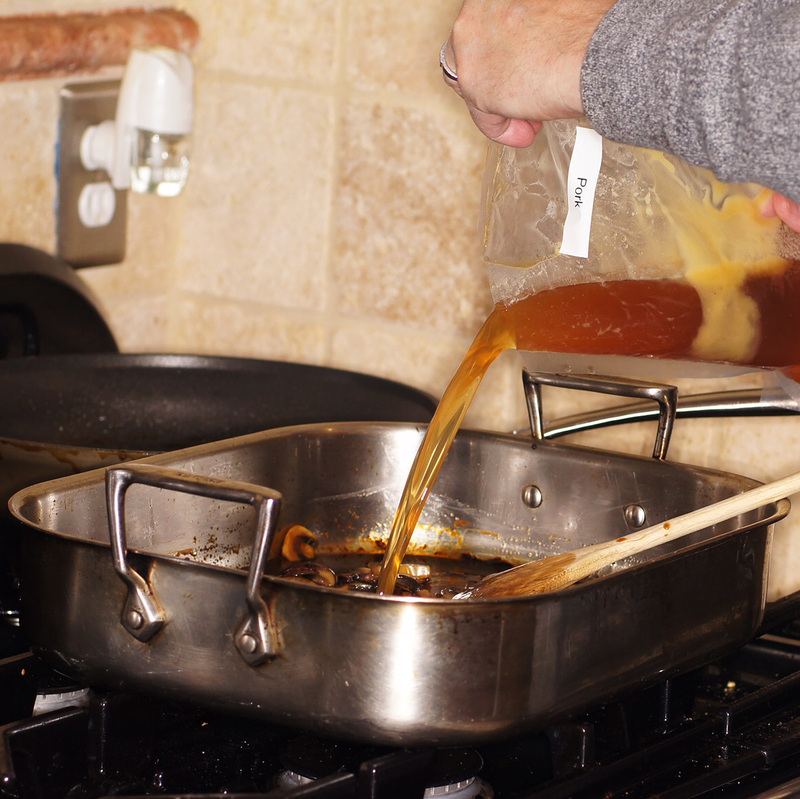 This will tighten the sauce and reduce the amount of liquid. Now, keep in mind that roux is like salt. You can always add more but you cannot take it out. 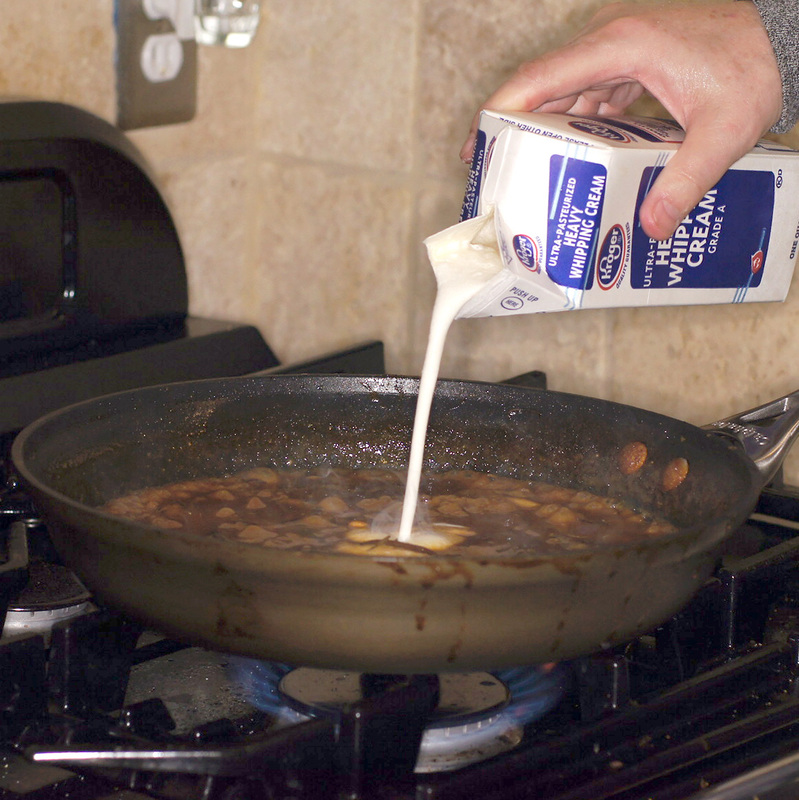 Too much roux with give you a “lumpy, fatty, gloopy gravy-like sludge.” Now, with this recipe, inasmuch as we are adding cream, it can be a little thicker. So, add the cream to thin it a little and give it a nice silky texture. NOTES: Pork Loin is NOT the same as pork tenderloin. 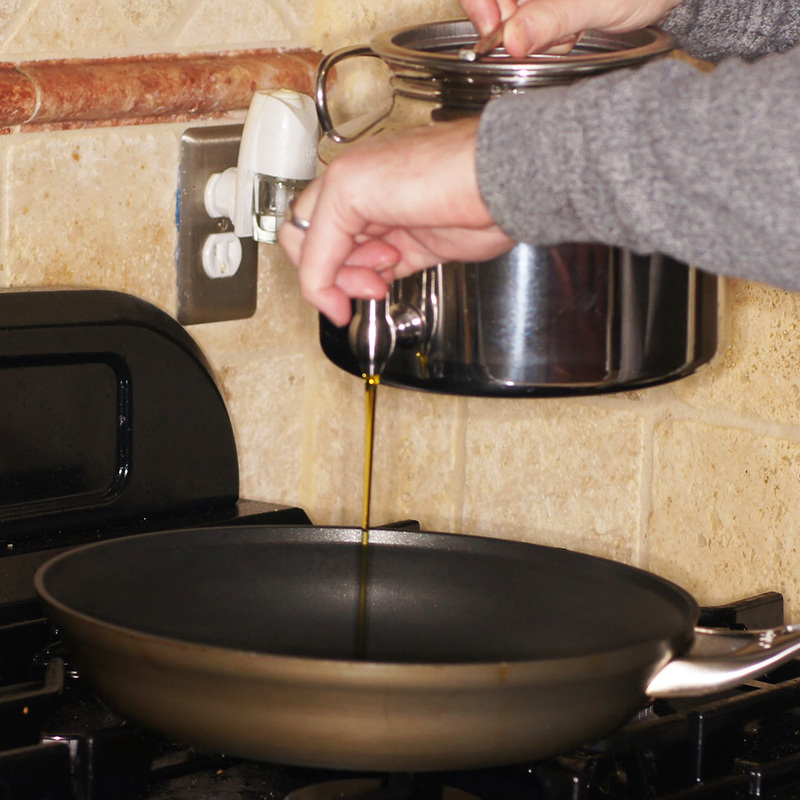 We cook both so it might be somewhat confusing on the blog. Pork loin is a cut taken from the back of the pig. Pork loin is also called center cut pork loin roast, center cut pork roast, pork center loin roast, pork loin center cut, and pork loin roast center cut. It is analogous to a beef ribeye roll. 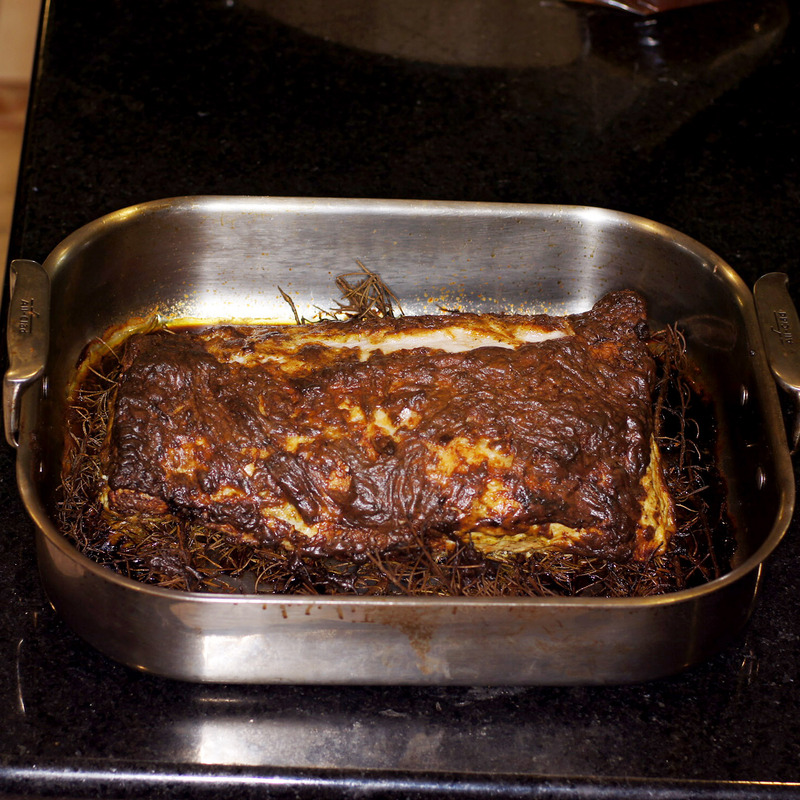 A pork loin roast is the same thing as a rack of pork except the ribs are removed. 2 racks of pork are tied together in a circle to make a crown pork roast. It is a larger cut of meat and a full boneless loin can weigh upwards of 8 lbs. Because it is such a large cut of meat your butcher will gladly cut it down to any size you want. If he won’t find another butcher. Pork loin is a fairly lean, mildly flavored meat with a thick cap of fat on top (the fat cap) that is tender if cooked properly. Pork tenderloin, on the other hand, is the muscle that runs alongside the backbone. Some people call it a backstrap. It is analogous to a beef tenderloin from which filet of beef is made and averages between 1 – 1.5 pounds. It is a lean, delicately flavored meat that is the most tender cut of pork if you are cooking it quickly. Oh Richard, I could eat the screen that looks so delicious to me right now! I know what you mean about not having time. I have an Indian Butter Chicken recipe I photographed from several months ago, but then it got screaming hot and made no sense to post it. Come fall I will. You are lucky to have a photographer. I can’t get my “gratuitous” pouring shots unless I set up the tripod, and I’m a bit too lazy for that, hehe. Very nice dinner! That she does! Giver her my kudos. Thanks Richard for the shout out. I was smiling as I read through the post. So much of the check and balance stuff done over there by Baby Lady is performed here by the long suffering “Wife”. Your almost hidden reference to “lumpy, fatty, gloopy gravy-like sludge.” didn’t escape unnoticed either. You are a bad (good) man. This is perfection! I love your blog, Richard! Thank you so much!!! Thanks Serena. You are too kind. If I only could take photos like you. I keep trying sooooo maybe someday although I doubt it will be anytime soon. Wow that looks so good! I’ve roasted chicken on a bed of rosemary, but not pork? Why not?!!! A beautiful meal. Say hi to Robert for me. I don’t think I’d recognize him!!! Thanks Sandra. It would be too organized for me to keep a notepad and a pencil anywhere near me at any time. 😮 We take sooo many photos I can generally figure out what was what and how much by looking at the photos. 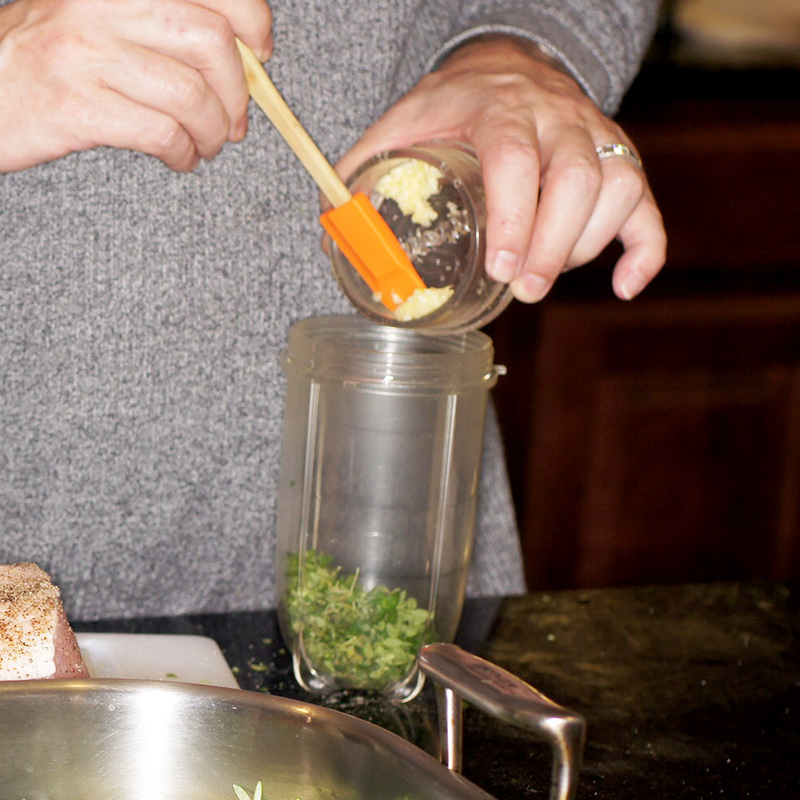 Do you remember if the rosemary flavor came out in the pork roast? People always ask us why Kees and I don’t get like Robert used to be because of all the delicious food I make. Our ‘secret’ is the same, although I would include some portion control on the list. From the photo it looks like you used beurre manié, which is a mixture of butter and flour, to thicken the sauce, rather than a roux, which is cooked butter and flour? 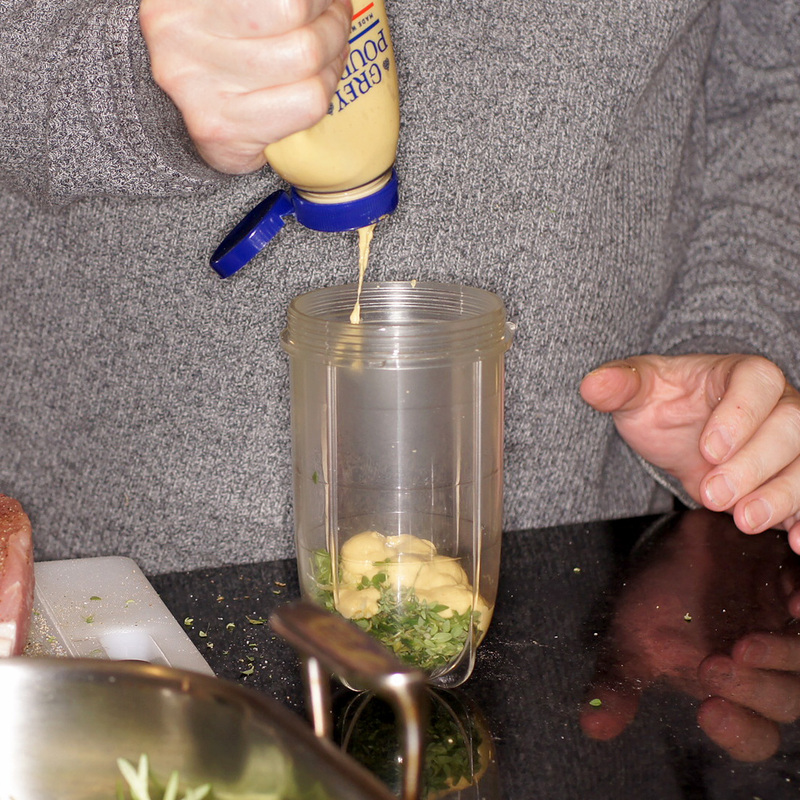 We have plenty of rosemary so when I get around to making my own mustard, this may be a good dish to try it with! Hi Stefan. I agree with you on portion control. It has a significant part in any diet. Sadly, portion control is the most difficult part. It definitely helps if you can have larger portions by controlling the quality of the food. Robert eats very low carb meals except for breakfast and he does have bread with his sandwiches. His 2 packs are typically fruit of me kind although he does periodically have popcorn. Dinner, however, for the most part has very little to no carbs. He really looks great and we are so proud of him. As for the roux, I hardly ever do small batches of roux, i.e. 2 Tbsp roux & flour, on the stove. Instead, I use the microwave. I first melt the butter, then add the flour, stir to incorporate thoroughly and them microwave for 30 – 40 seconds with a napkin over the top to prevent messes. This cooks the flour but it also keeps the yellow color. 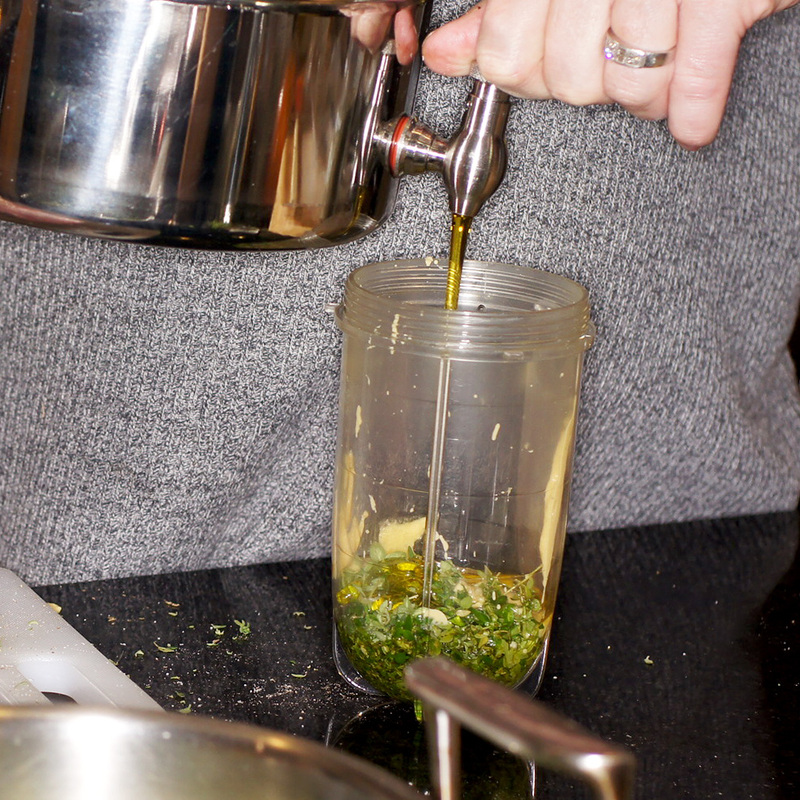 I use beurre manié periodically and have even shown Baby Lady how to make it. Beurre manié is with softened butter, i.e. room temperature, with equal amount of flour that you more or less massage into the butter to form somewhat of a paste. I let it chill after it’s made and portion it out rolling it into little balls about the size of a small walnut. 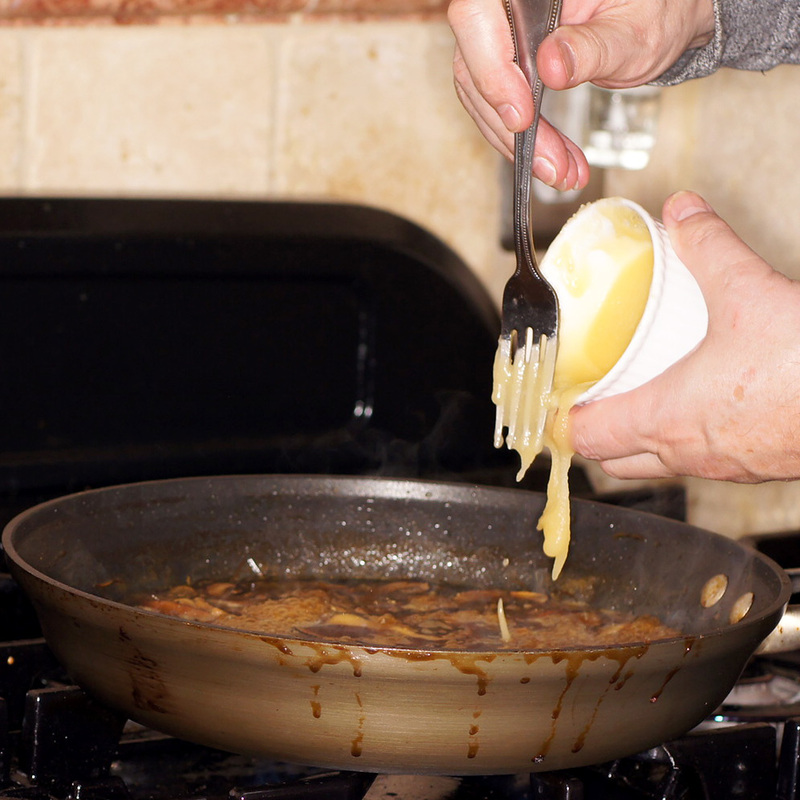 You can then add the beurre manié a little at a time to a soup or sauce to thicken it. Beurre manié takes a little more time to cook out the flour but unless you are dealing with a brown roux you will need to cook out the flour nonetheless. Last, the rosemary. We were rather disappointed the rosemary wasn’t as prominent. 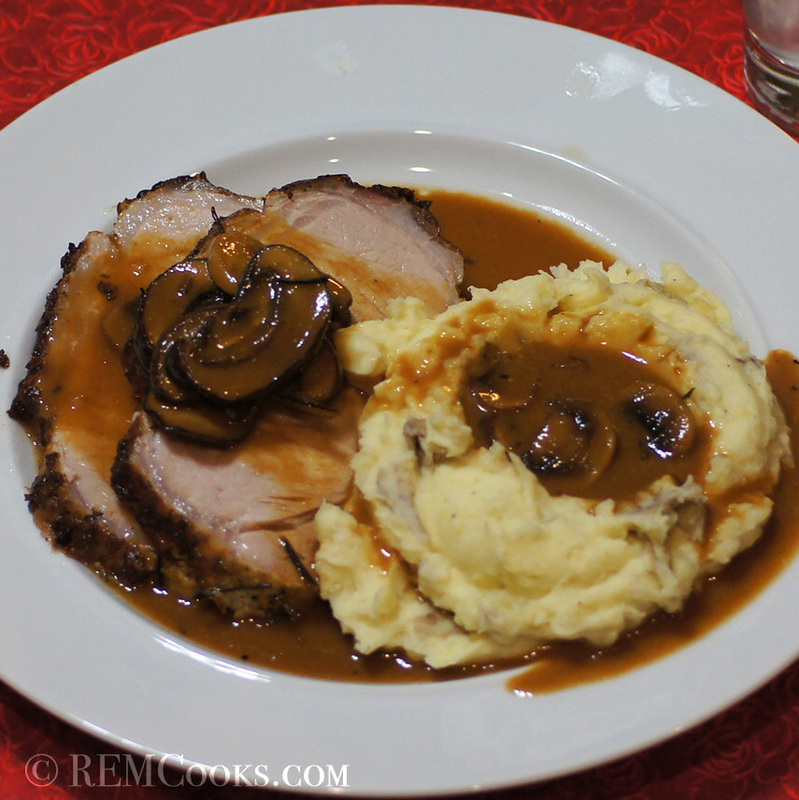 It was very noticeable in the sauce but had very little effect upon the pork loin itself and then only on the bottom side in contact with the rosemary itself. Hope you guys are having a fun trip through Italy. Now I understand why I thought it looked like beurre manié. 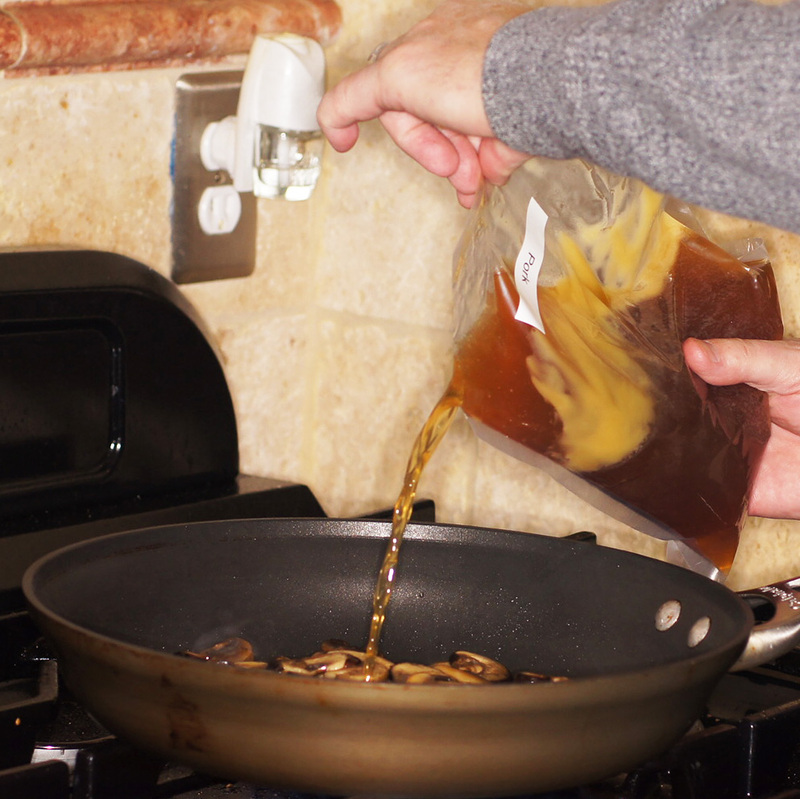 I’ve never added roux to a sauce, but always sauce to a roux, so that is an interesting new technique to try. It may actually be a good idea to try thickening a reduced stock with corn starch slurry, roux, beurre manié, and taste them side by side for a post on the blog. I’m going to try something similar, but have to think about some other solution for the rosemary. Perhaps making rosemary ‘tea’ and using that for a brine would work. We have arrived in Italy last night. Today and tomorrow the weather is not so good, so I guess we’ll kill the time by visiting some wineries 🙂 As you already noticed on Facebook (and you can now read on the blog), our first dinner was a success. I really wish rosemary was a perennial up here. We just have small plants. 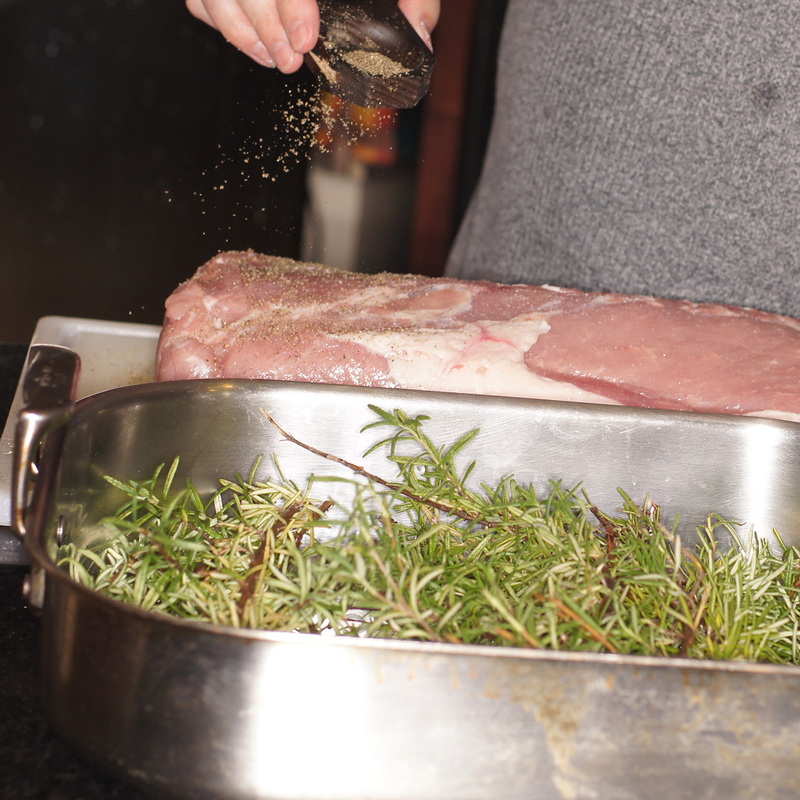 I love this idea of roasting the pork over the rosemary. Delicious. When we lived in Malta we could just go out into the countryside and pick it. We could do the same for arugula (rocket) as well. One of the benefits of living in a country in the middle of the Med. Sea. 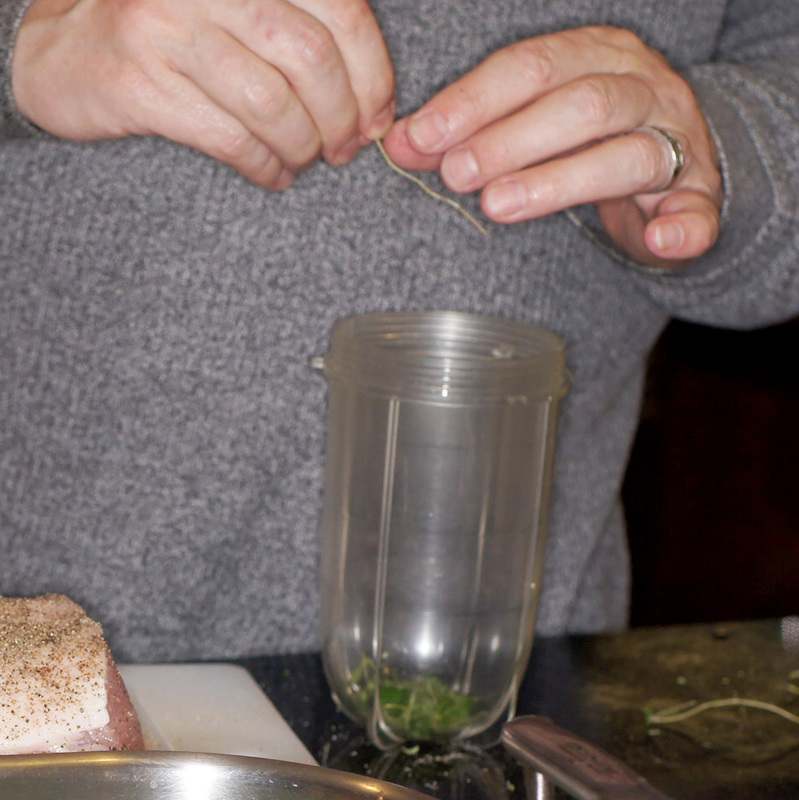 I thought for sure the rosemary would’ve scented the pork more… interesting. What if the rosemary were ‘bruised’ a bit ?? Either way, this looks fabulous!